Okay, sometimes I interview a colleague for the blog and the answers are so lengthy, I have to do extensive editing. Well, I couldn’t bring myself to trim almost any of Carey’s thoughts… because what this gal has to say is incredible! Indeed, she’s an inspiration to Cleveland’s classical music community and a total joy to work with on Classical Revolution Cleveland projects! Hi! Tell us a bit about yourself! I’m originally from the small town of Paducah, KY. I was fortunate to grow up in a musical family with very dedicated parents who kept me practicing (even when I didn’t want to). When I switched from violin to viola at age 11, I travelled to Nashville, TN every week for lessons, chamber music, and orchestra at the Blair School of Music. In 2011, I joined the studio of Ivo-Jan van der Werff at Rice University where I earned my Bachelor of Music with an award for Distinction in Research and Creative Works. I fell in love with Houston while attending Rice but Cleveland was calling me and I moved here specifically to study with violist Lynne Ramsey. It was a rough transition from sunny Texas to overcast Ohio but I made it and am happy to say I am graduating this May from the Cleveland Institute of Music with my Masters in Viola Performance! In a city that bustles with independent classical music projects, what makes you unique? It took me awhile to get acclimated to being a Masters student at CIM, but over the past few months, I’ve gotten more and more involved in the community, and playing with Classical Rev has really opened me up to the many diverse performance opportunities in the area. I think what makes me unique as a performer is my willingness and ability to jump into just about any performance situation. My belief is that the future of classical music is dependent on three crucial components: versatility of classical musicians, supporting new music and living composers, and strong advocacy for music education. Versatility can often be the most difficult and uncomfortable component for classically trained musicians but I believe it is vital to engaging a wider variety of listeners. Whether it’s playing solo Bach in the African Gallery at the Cleveland Museum of Art, or improvising off of a bass line and playing Irish jigs with Ariel, Cleveland has provided me with many opportunities to expand my skill set and reach new audiences. What performances do you have next? While in my undergrad at the Shepherd School of Music, I formed a group with my two best friends, Grace Burns (piano) and Christen Sparago (flute). We played this gorgeous piece by Maurice Durufle written for our ensemble and we were hooked- we had to find more music for this trio. We knew we needed a name and decided on the modern Greek word “Meraki” which is used to describe doing something with soul, creativity, or love. It can also mean the energy and enthusiasm one infuses into their work – a perfect description of the spirit of our ensemble. Unfortunately, our repertoire was limited so after doing a few transcriptions ourselves, we embarked on a commissioning project. Long story short, we successfully obtained a grant then commissioned and premiered five works by student composers at Shepherd. After graduating almost two years ago and going our separate ways, we are looking forward to reuniting for a three-day Cleveland Residency. On April 22nd I’m hosting a relaxed house concert featuring a mixture of standard, contemporary, and popular repertoire. Our main event is a full length recital at 2pm on April 23rd as part of the St. Peter’s Fine Arts Series in Ashtabula, followed by an interactive children’s performance on April 24th. One of the best things about this trio is how at its core it completely incorporates the three elements mentioned earlier of versatility, support of new music, and advocacy for music education. I am so excited to join my two worlds and share this Houston-grown passion project with my Cleveland community! Any focus on education/outreach/community engagement? Since I first started playing music, my parents instilled in me a desire to give back to my community through free concerts in hospitals, nursing homes, facilities for adults with disabilities, and local schools. These experiences continue to shape my outlook as a musician. I have enjoyed many opportunities to engage with the local community including teaching at the Cleveland School of the Arts and with Rainbow Strings in East Cleveland, as well as free performances in libraries and assisted living homes in the area. Inspired by recent Classical Revolution CLE performances benefitting refugee services in Cleveland, I am joining up with fellow CIM students to host fundraising concerts for various organizations which support the LGBTQ community, the Black Lives Matter movement, and refugees. We are still in the very early planning stages but will provide more information as we have it! Tell us about your long-term plans! I get great fulfillment from being a performer – whether it is on a large concert stage or in a preschool classroom – but I believe I could have an even larger impact on the future of the arts in an administrative role. My passion for music fuels my drive to work and I have a strong desire to be an advocate for the arts through a career in arts management. So far I’ve been fortunate to be trained through internships with various music organizations as well as from my job in the Robinson Music Library. The incredible staff there have trained me as a Research Services Supervisor which has contributed significantly to my growth while at CIM. Following graduation, I will be joining the National Repertory Orchestra for the summer as the Marketing Intern. When I return to Cleveland, however, I intend to stay highly involved as a performing musician. The commissioning and collaborating I’ve done with Meraki is the type of work I am most interested in pursuing and it is my hope that I can provide support to more of these contemporary ensembles as an administrator. No matter where my career takes me, I’ll always be a violist! Craziest gig or performance memory? My very first gig in Cleveland was probably my most eventful so far. With my brother Wesley (a fabulous cellist and CRC veteran) already living here and some friends scattered around the area, I had a wedding booked within the first two weeks of arriving. The wedding was scheduled late on a Saturday afternoon and I decided to spend the morning visiting the animal shelter to adopt a cat. As I was excitedly driving with a car full of friends to go pick out my new pet, traffic came to a full stop on the interstate and I got rear-ended and pushed into the vehicle in front of me. My car was totalled and we spent three hours on the side of the road waiting for the whole mess to get cleaned up. When I was finally able to get home, I was in a rush to get dressed and get to that wedding! Everyone chipped in to got me there on time but I felt pretty frazzled. The gig itself was, fortunately, not crazy but rather a testament to the wonderful musicians in this area and their remarkable flexibility. Rockstar cellist and all-around awesome person Cori Lint (also once featured on this blog!) put my mind at ease and the wedding went very smoothly. The happy ending of all of this is that the next day, my wonderful brother managed to finally get me to the animal shelter where I adopted my furry friend, Murray! Talk about your most moving and satisfying performance memory. When the Boston Marathon was bombed on April 15th, 2013, the Shepherd School Symphony Orchestra was preparing for our performance of Mahler’s Symphony no. 2. I recall the days following that event being filled with confusion, fear, and hurt. When it came time for us to perform the Mahler, there was still a lot we did not know about the bombing and the concert hall felt very emotionally charged- both for the musicians and the audience. That experience was by far one of the most moving performances I have ever been a part of. I felt a stronger sense of communication with my colleagues around me and the roar of applause from the audience at the end told me they felt the same thing. It brought our community together and we stayed on stage for what felt like an hour afterward- hugging and crying with our fellow musicians as we faced our appreciative listeners. I doubt it originated with this particular performance, but the act of hugging your stand-partner and other colleagues at the end of an orchestra performance became a one of my favorite traditions at Rice. This concert was a beautiful example to me of the healing power of what we do. There are so many things! I love playing with my cat, cooking all kinds of food, and pretty much any type of organizational work (you never, ever want to take my schedule planner away from me). But probably my favorite pastime outside of the practice room is photography. I’m no professional but I’ve taken classes and I love that it provides me with another artistic outlet. My favorite type is street photography. I get to explore a part of whatever city I’m in and get a glimpse into the lives of people just walking down the street. Favorite NON-classical music and/or artistic inspiration? I think this tends to be a controversial topic among classical musicians but I love pop music. Especially when I’m trying to keep my blood pressure down while driving, it helps me relax and brighten my mood. I listen to a lot of indie music like Sufjan Stevens and Bon Iver for the unique effects and instrumentation they use but I also love more upbeat artists like Beyonce and Bruno Mars. 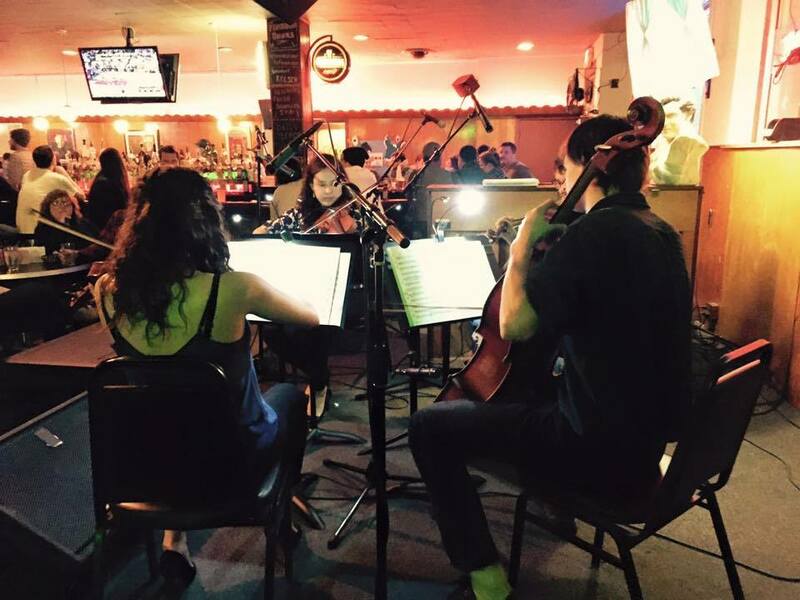 What do you love most about Cleveland’s independent classical music scene? I have been very encouraged by the strongly empathetic and driven community of musicians I have met in Cleveland- it is unlike anything I have ever experienced. I am constantly surrounded by passionate colleagues who want to change the world with their talents and who bring high standards to every performance, no matter the venue or audience. I feel very lucky to have these people as my inspiration! Next Musician Feature: Rebecca Shasberger!